In this week’s column, resident historian Brian Little remembers the iconic Winter Gardens in Banbury, where everything from The Rolling Stones to roller skating came to entertain. Last occasions are both an opportunity and a challenge to journalists writing for local newspapers such as the Banbury Guardian. Two people with good reason to care were pictured responding to Ken Prewer’s final dance for those on the floor of the Winter Gardens, Banbury’s premier entertainment centre. Proprietor Ethel Usher and band leader Brownie Lay were those two people. 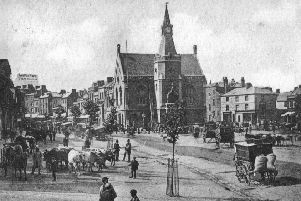 When interviewed Mrs Usher made a number of significant comments including the description of the last Saturday night as a ‘dewy-eyed affair for scores of local people’. Some of whom at least may well have attended the 1956 Police Ball which also featured the Ken Prewer Orchestra and had offered hope of financial success to the new venture that seemingly was not achievable from the initial activity which was indoor bowls. Looking back down the years, Mrs Usher described the Winter Gardens as ‘the scene for countless boy-meets-girl episodes at dances and roller-skate discos’. At the start of this article I hinted at the limited public response to the closure announcement. The Banbury Guardian had set up a survey of people’s views and was disappointed by the number of replies. However their article did feature some interesting reactions. An R Gee of Deddington thought an evening coach service to the Winter Gardens taking in the larger villages would improve attendances at the various events. Banbury’s Vicky Lawrence mourned the loss of roller skating sessions and pointed out many people had bought their own skates recently. 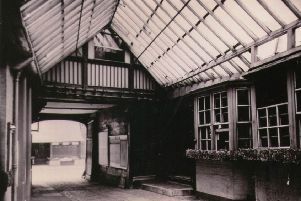 Guardian staff noted some people wanted to see ten-pin bowling and ice skating at the Winter Gardens but most who took part in the survey wanted things to remain in their existing format. When roller skating started it was dubbed ‘New to Banbury’: the opening session was a Grand Gala. Highlights included an all-star championship exhibition presented by the Embassy Roller Rink in Birmingham, exhibition skating by former world champion Jean Pheathian and presentations by the Television Formation Dance and Speed teams of the Birmingham Roller Skating Club. Boxing and wrestling had been equally popular. Supporters of the former were encouraged by an invitation to the new Winter Gardens to sample a grand tournament between Banbury and District Amateurs and Bicester Garrison Amateurs. Wrestling attracted huge support. Big names were featured, notably Big Daddy and Giant Haystacks. However Saturday afternoon appearances by Jackie Pallo and Lou Marco meant they made their names in Banbury. Attendances at some Saturday events could be as many as 1,500 people. There were trade shows, fashion events and antique fairs. The food and drink aspect was not neglected. Mrs Usher bought the High Street Wine Vaults, which was renovated 1944 and then built the Inn Within, the Lounge Bar and Off Licence in 1951. This was at the time the first new pub in the district and also the first to serve lunchtime food. During 1982 this dance floor was demolished and boys in ‘Teddy Boy’ gear and girls with beehive hair became just a memory. Past dance billings had included Victor Sylvester, Joe Loss and Johnny Dankworth, whilst vocal contributions had come from the Hollies, Wayne Fontana and the Mindbenders, the Tremeloes and the Rolling Stones. Ethel Usher rejected trying for the Beatles because of the extra expense involved. As they progressed across the floor on that final night, Brownie Lay and Ethel Usher could not have imagined that in 2019 Banbury’s Mercure hotel in the Horse Fair would be accelerating the tempo in a new era of dance floor activity, Strictly Whately.